Simply speaking an apprenticeship is a job. This means you will earn a wage whilst learning valuable new skills that are needed for the industry you are working in. The difference between an apprenticeship and regular employment is that you will be engaged in education for a set amount of time to gain a qualification. An apprenticeship will give you the chance to earn and learn at the same time. If you want to take your education to the next level without having to spend too much time in a classroom then an apprenticeship might be an option for you. The entry requirements for apprenticeships, and the end qualification you will acheive, depend on the level you start at. These start at level two and go right the way up to seven, any qualification at level four or above is higher education. 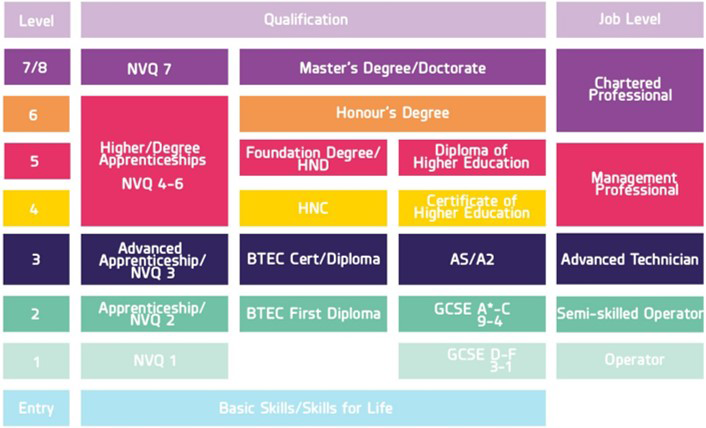 The diagram below shows how qualifications are equivalent to one another and the qualifications you will need to access your next level. It is possible to use a level three advances apprenticeship to progress to university because it is equivalent to A-Levels. If you would like to go on to university or higher education at a college then you should research which institutions will accept apprenticeship qualifications in their entry requirements. This will often depend on the employer and type of apprenticeship you are doing, but generally you will spend four days a week at your place of work and one day a week at a place of study. The one day per week that is dedicated to study will be at a college or university and will involve classroom study to learn about your chosen industry. An apprenticeship is a job, so the vacancy will be advertised by the employer in many cases. Colleges and univerisites usually have a vacancy page on their website that you can apply through. If you are interested in apprenticeships you could set up an account with the official government website, this will keep you updated with the lastest vacancies which you can filter by industry, level, and location.